Leon H. Washington Jr., left, publisher of the Sentinel, marches in a picket line with a sign that says “Don’t Buy Where You Can’t Work” in a photo published Jan. 2, 1947. Jan. 2, 1947: At its convention in Cleveland, the American College of Surgeons admits a delegation of 10 black surgeons — none of them from Los Angeles. “The initiation of the 10 fellows of the college brought to a close one of the most effective campaigns ever waged to crack an existing color bar in medicine,” the Sentinel said. Founded in 1913 to promote high standards in surgical care, the association had one black charter member, Dr. Daniel Hale Williams, FACS, of St. Luke’s Hospital in Chicago, who died in 1931. Dr. Louis T. Wright, director of surgery at Harlem Hospital of New York, became the next African American member in 1934. The association was criticized by Dr. G. Thorne, visiting surgeon of Harlem and Sydenham hospitals in New York, for its lack of black members. An investigating committee found that black surgeons’ admission applications had been ignored for many years. In 1946, the association admitted a gynecologist at Sydenham and Harlem hospitals in New York and two surgeons from Provident hospital in Chicago. The 10 new members of the association were from New York, New Jersey and Philadelphia. In 1948, the association admitted 12 more African American surgeons at its convention at Philharmonic Auditorium in Los Angeles, though none of them was local. 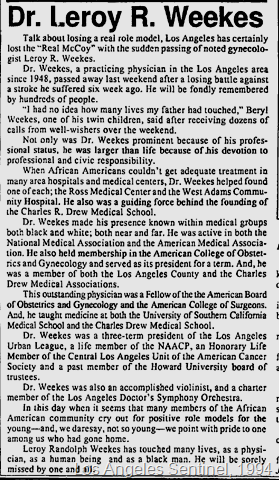 This entry was posted in 1947, African Americans, Medicine, Obituaries and tagged 1947, American College of Surgeons, Dr. Leroy R. Weekes, Los Angeles Sentinel, medicine. Bookmark the permalink.